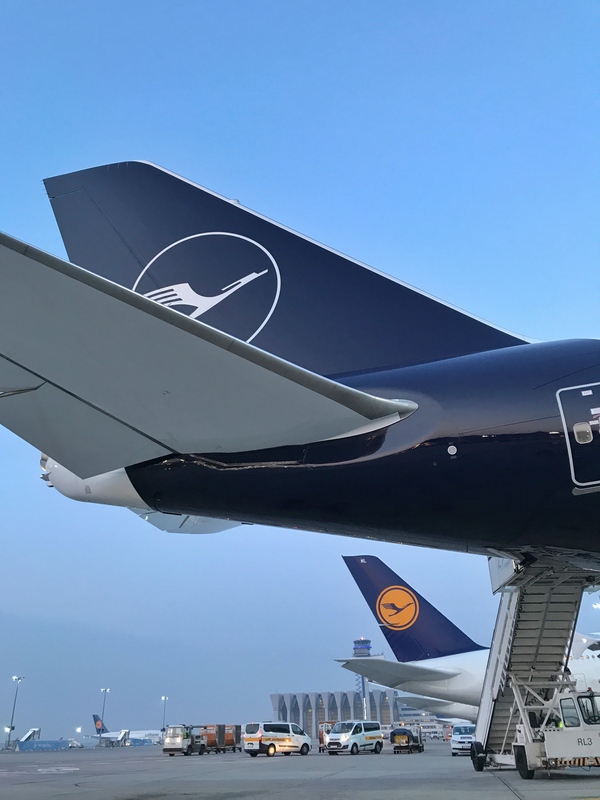 Lufthansa, Germany’s flag carrier, unveiled its new logo and livery redesign on February 7, the 100th anniversary of its crane logo. The most shocking design update centers around the new livery (exterior branding) which replaces the classic yellow logo with a thinner white logo on a darker blue. The only remaining yellow on the exterior of the aircraft is a rectangle that says “Willkommen” and “Welcome” painted just outside the door near the cockpit. Many people lament the yellow missing from the crane logo on the plane, but yellow is still incorporated into the new branding in more subtle ways. 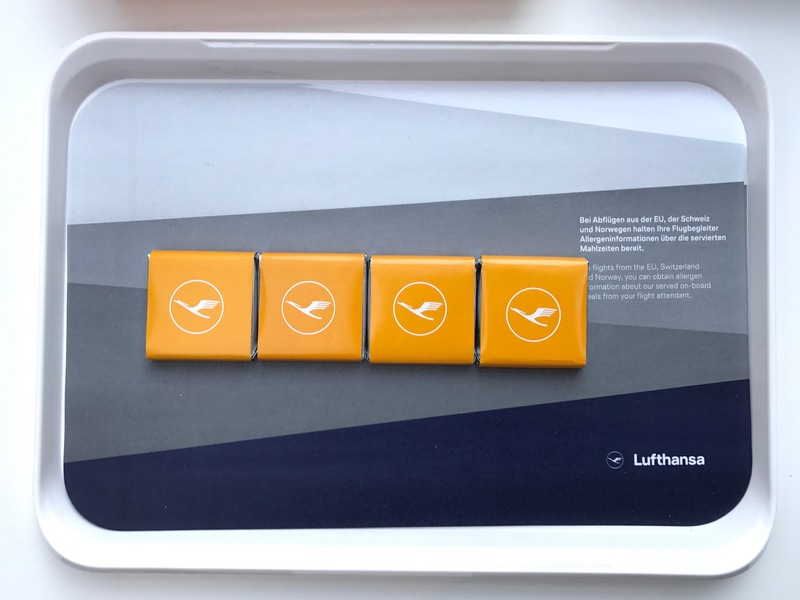 Lufthansa maintains the fully yellow boarding pass and still incorporates yellow in the signage, chocolates (pictured below), flight attendant scarves and new pillow covers. The goal was to modernize the branding for the digital age and the plane even includes the hashtag #ExploreTheNew painted on the side of the plane. 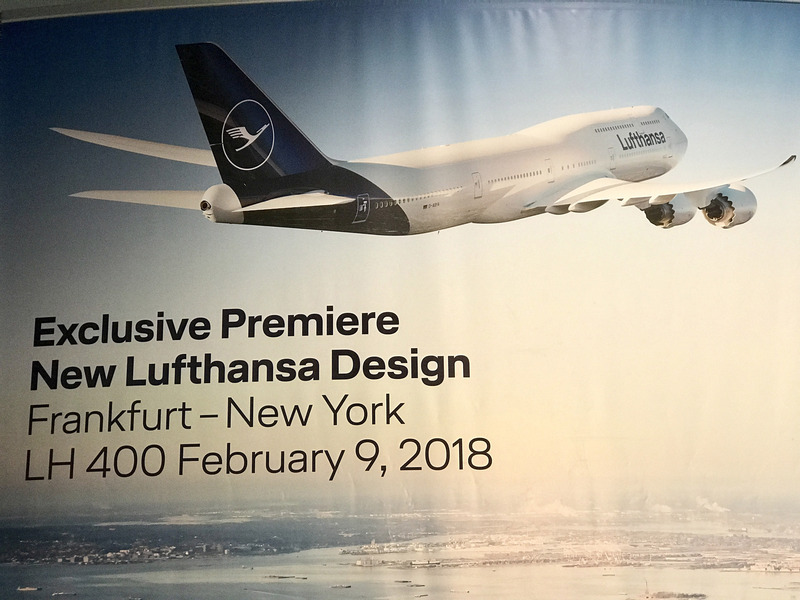 Thank you, Lufthansa, for partnering with me to cover the event unveiling the new logo and livery and providing complimentary flights from Newark to Frankfurt and from Frankfurt to JFK. 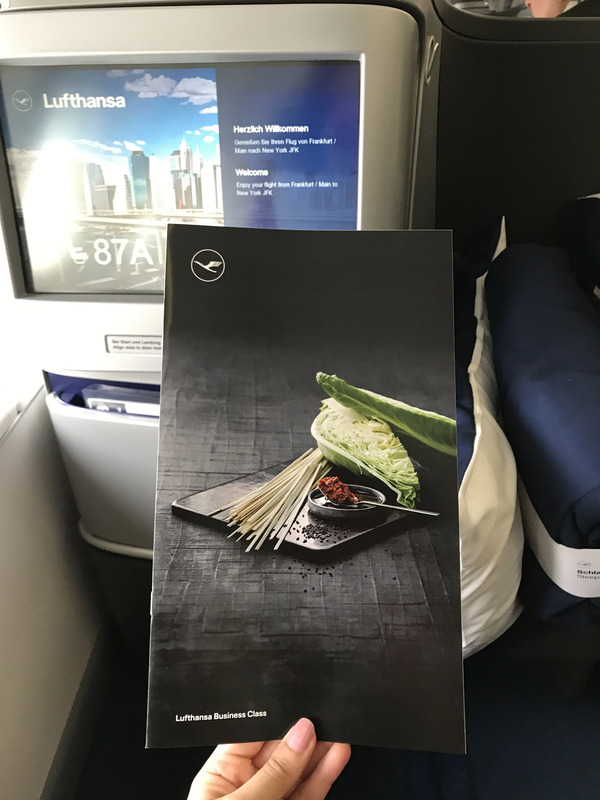 Read on for the full review and photos of the newly redesigned Business Class experience, including comparison imagery of the redesign before and after. 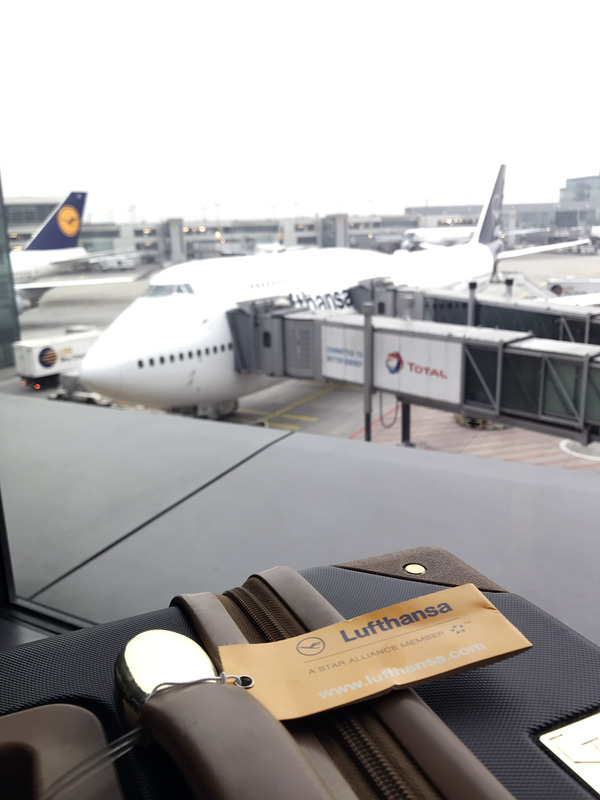 My experience checking in for the flight from Frankfurt to JFK online was quick and easy by clicking the link sent to my email. Checking in at the counter for my earlier flight from Newark to Frankfurt was also very quick. 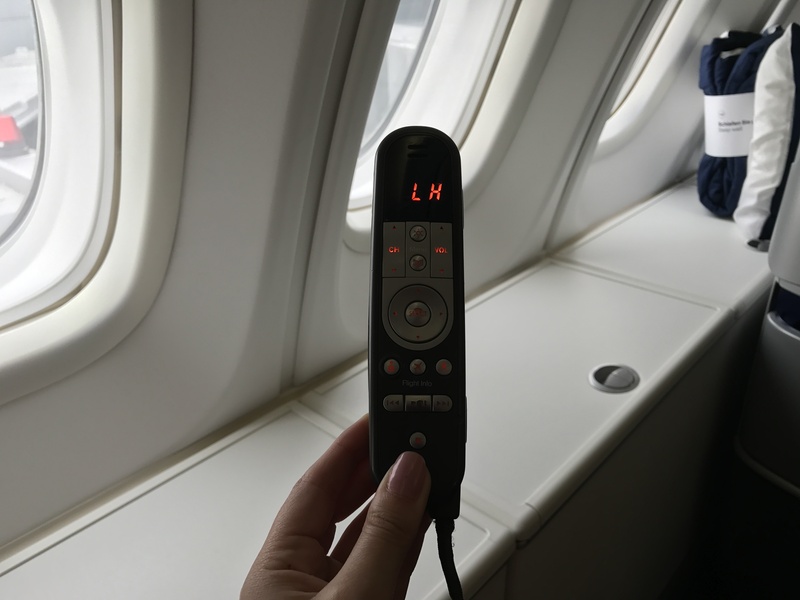 The representatives ushered me to the counter where I requested a window seat and was given the first-row window seat in the Business Class section. The staff were all very attentive and friendly. The Lufthansa Welcome Lounge is perfect for early morning arrivals like my flight from Newark to Frankfurt arriving around 7am where I could get WiFi and breakfast before the hotel check-in opened. The breakfast spread includes a range of hot options like scrambled eggs and cold options like yogurt and fruit! The fruit infused water is a nice touch and very refreshing. There is ample seating in this large lounge area as well as showers available. 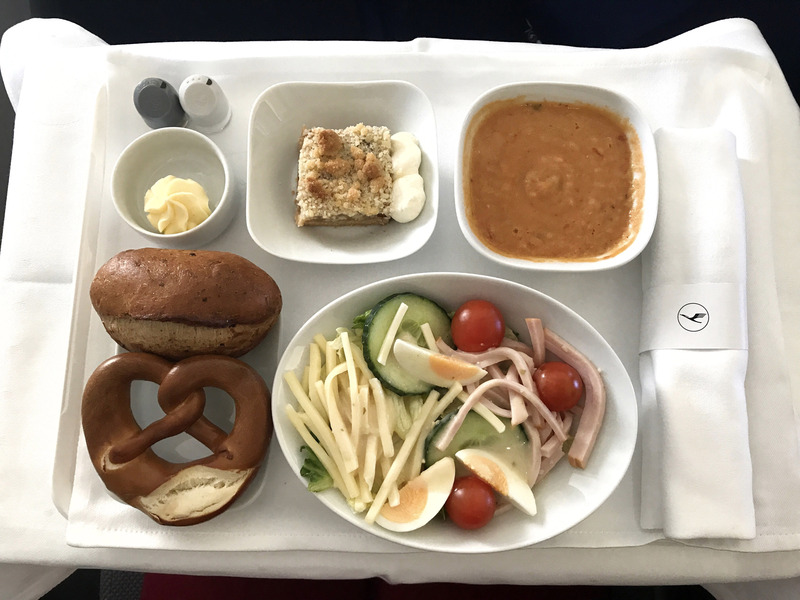 The Lufthansa Business Class Lounge in Newark was not very large but provided comfy seats and a range of snack foods, sandwiches and drink options. Pictured above is the before and after of the newly redesigned cabin seat details. 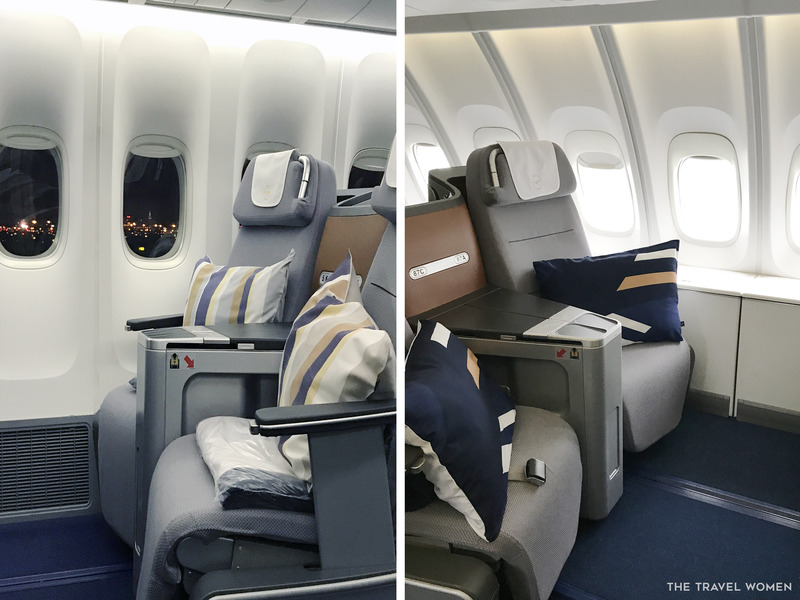 The business class seats fully recline to a horizontal position and include a head lamp for reading. These seats are ideal for couples traveling together since the seats angle towards each other so that your feet are next to your neighbors’ feet with a small barrier between you. The wrapped blanket has been replaced with a blanket presented with a paper ribbon. One of my favorite redesigns is the fresh new pillow case that replaces the more dated stripes with more modern diagonal stripe details on a prominently dark blue color. 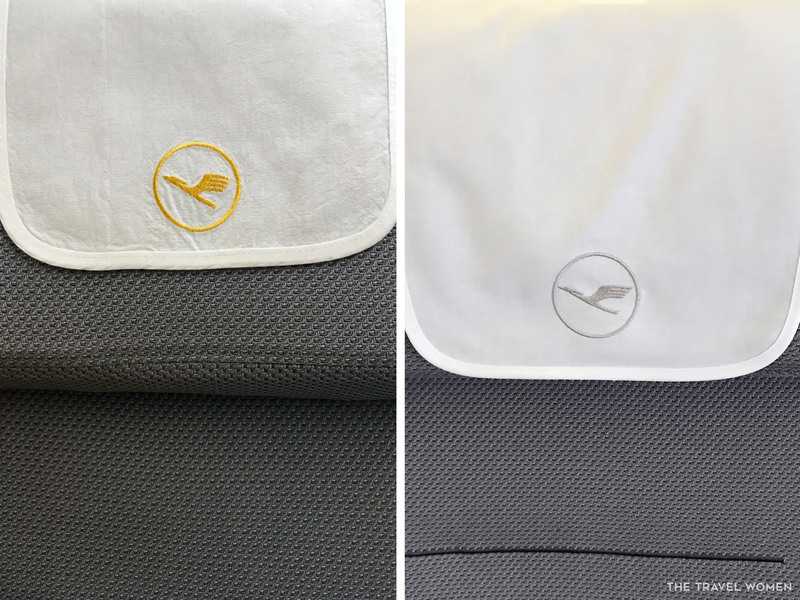 The Antimacassar, pictured below, the cloth on the headrest of the seat, replaces the previous yellow logo with the new thinner crane logo in silver, a much more elegant detail. There is more than enough storage above your head, on the side under the window and below your TV and feet. Bose two prong headsets are permanently attached under your armrest next to the remote for your TV (pictured below). 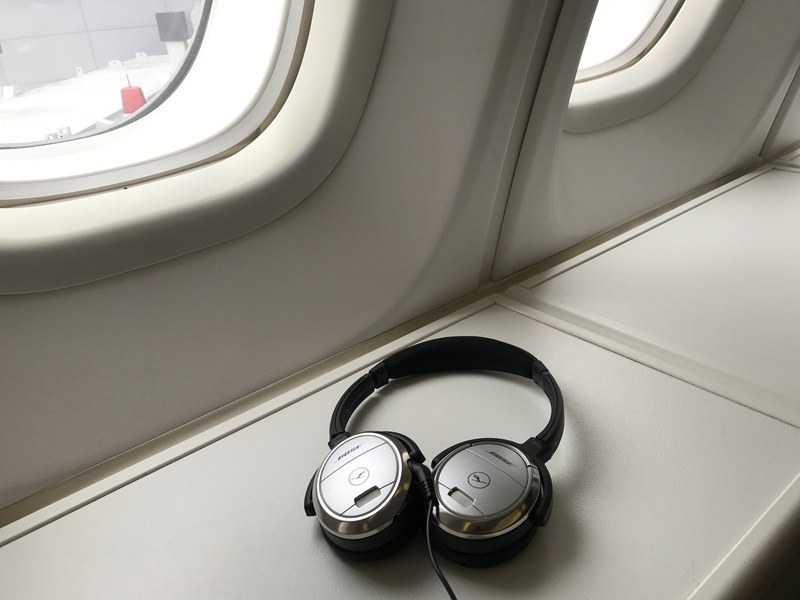 The Bose headsets (pictured below) are nice and the amenity kit includes covers for your headsets. 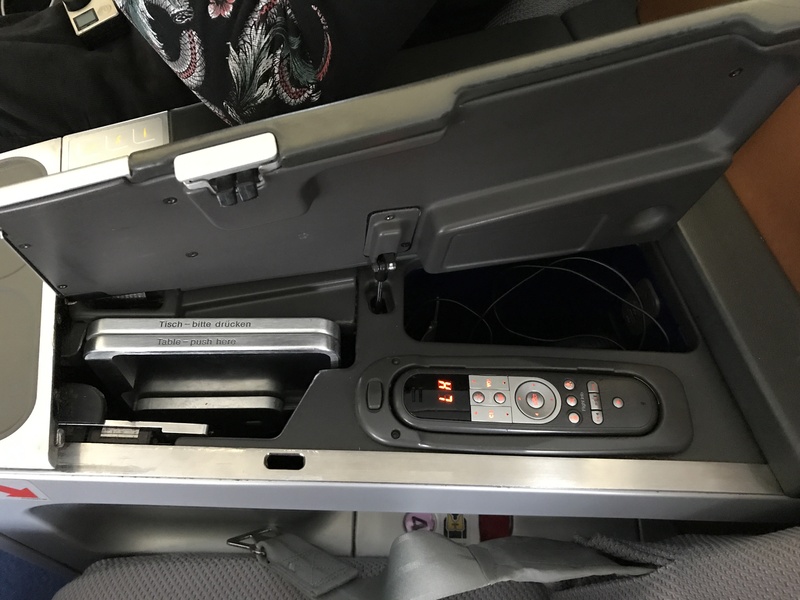 Under the armrest is the table; push on the table to allow it to spring up to be pulled over and folded out for a nice sizeable surface. 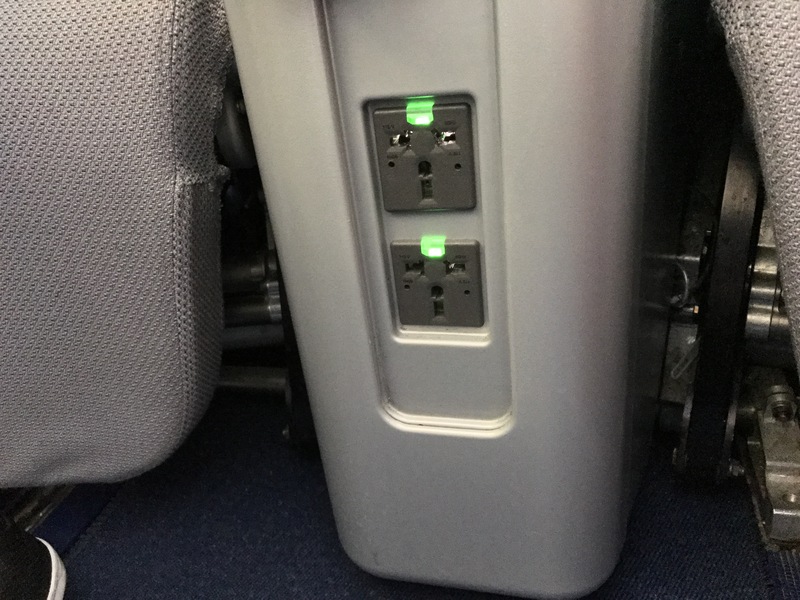 There are outlets available between the two chairs, next to your feet while sitting. 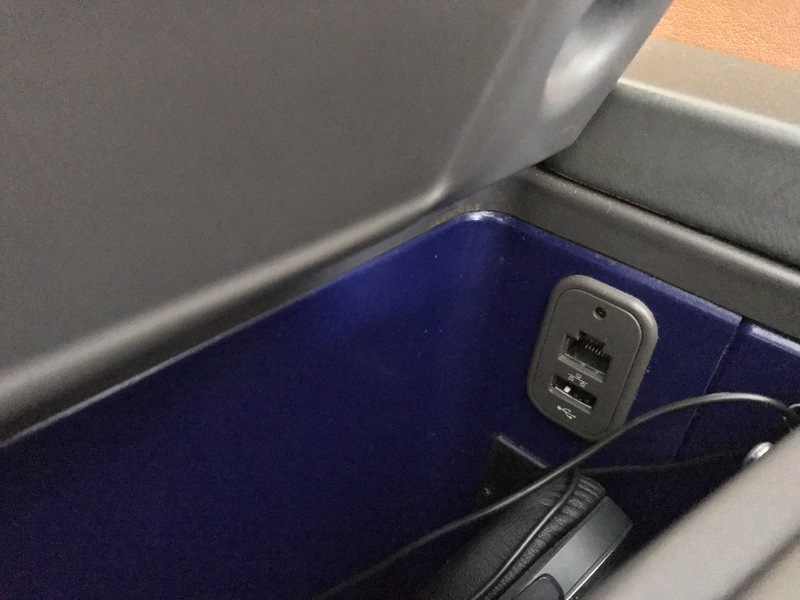 There are also USB ports (pictured above) available under the armrest near the headphones. 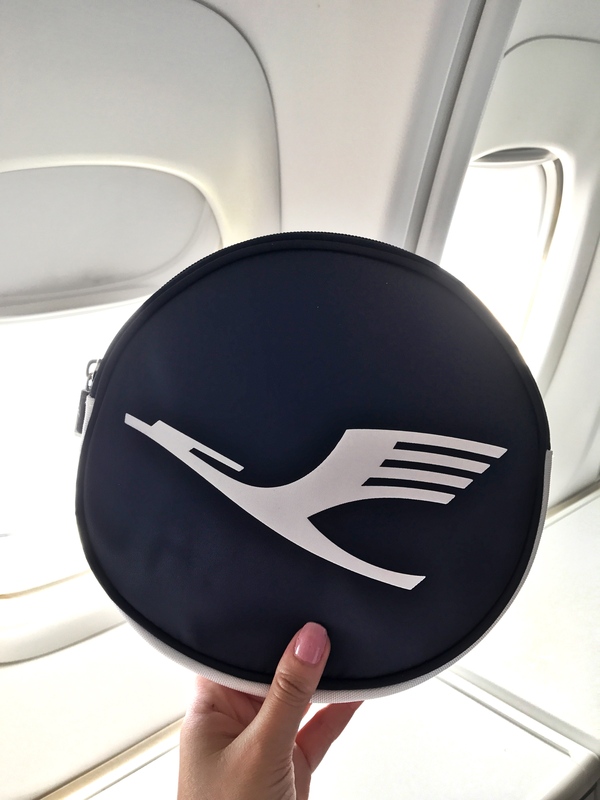 One of my favorite new features is the newly redesigned amenity kit, which replaced neoprene pouches with a high quality new circular zip bag. The bag with its long strap tucked inside can double as an over the should travel bag. The dark blue circular bag is lined with a white bottom and white crane logo. Crew members receive bags like this but they will have an all blue logo on the blue circular bag. The bathroom was clean and tidy including additional amenities and Korres soap and hand cream. 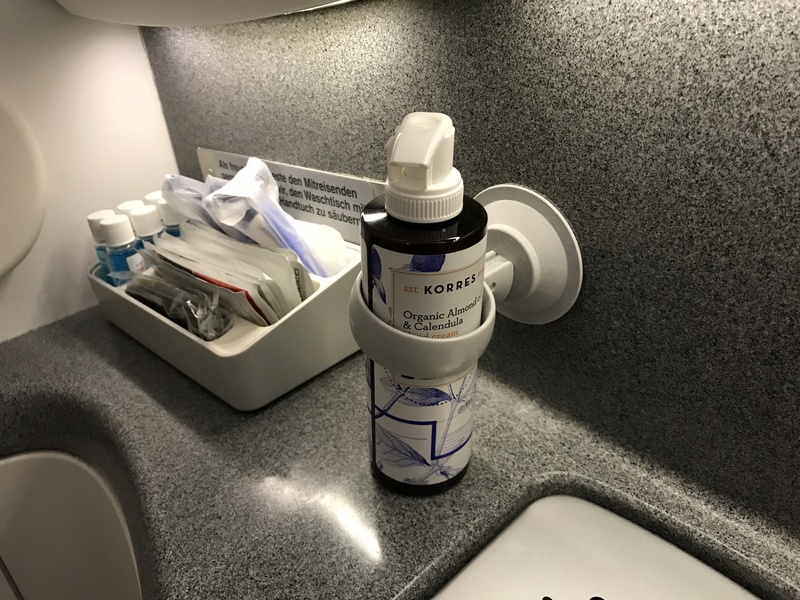 The Korres products smelled and felt great on my hands. Welcome drinks included a choice of water, orange juice or sparkling wine. Then flight attendants handed out menus and a small bowl of almonds. 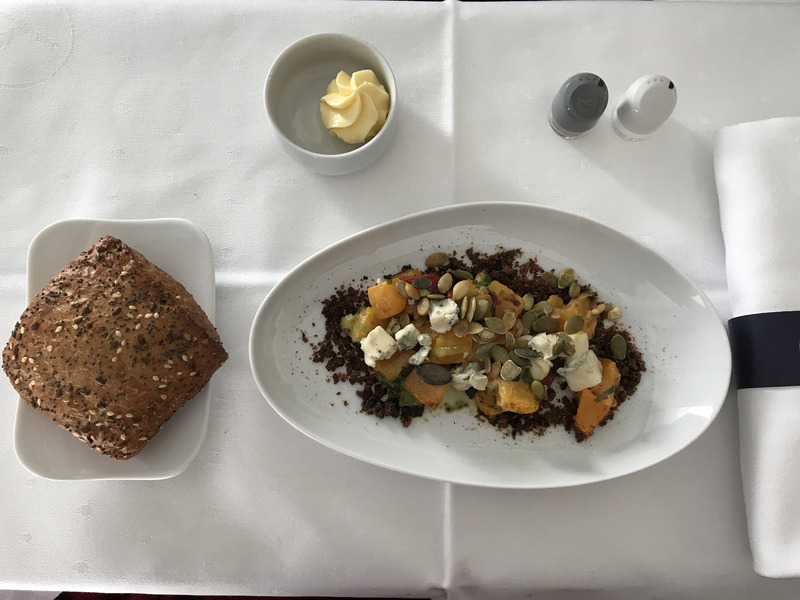 For my appetizer I chose the Pumpkin Salad which had a nice crunch of seeds between the sweet pumpkin and salty gorgonzola, which I really enjoyed. 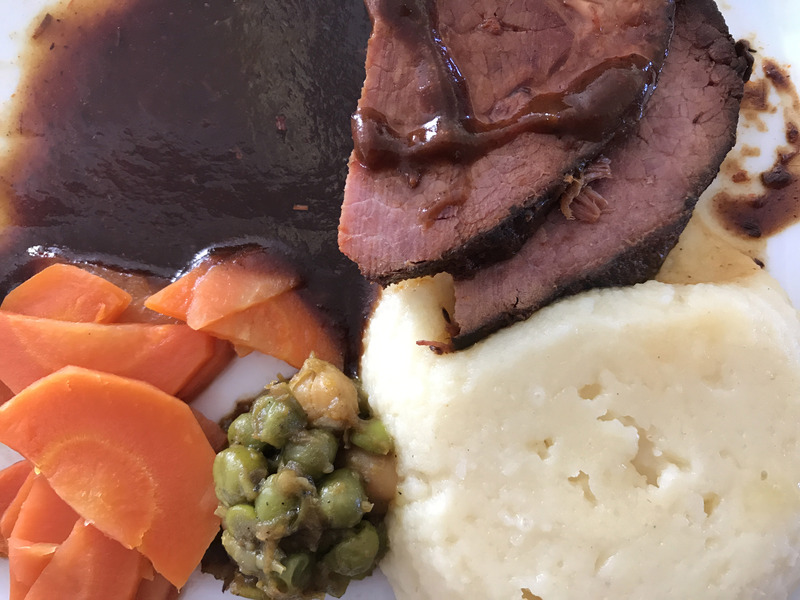 For my main course I ordered the braised beef with carrots and enjoyed the tender braised beef. 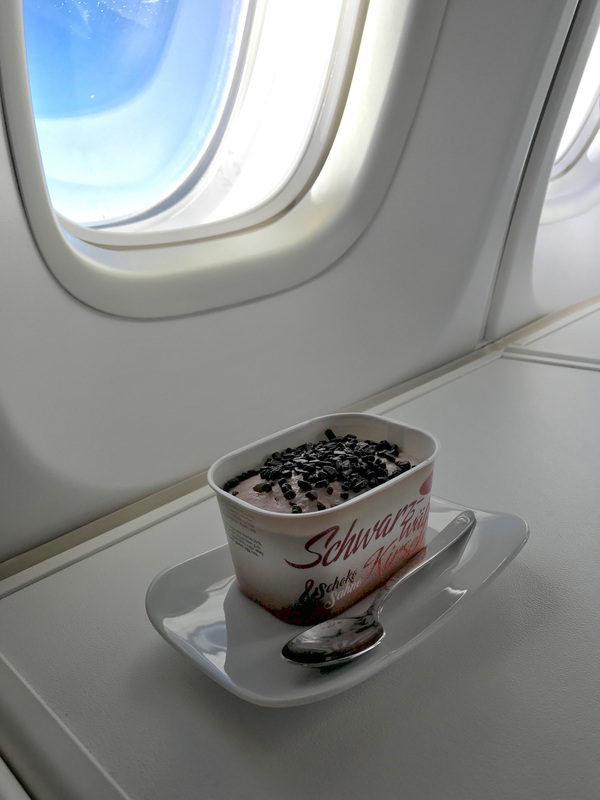 For my dessert I chose the traditional Italian ice cream and was happily surprised by the mini container of soft chocolate vanilla swirled ice cream with a cherry flavored bottom and crunchy chocolate chunks on top. It was a large sugary portion that I had trouble finishing! One of my favorite additions to this meal was that the bread basket options added a cute mini soft pretzel option! I loved how attentive the flight attendants were. They helped show me where my outlets were located (pictured above). They even offered to take my photo as they saw me taking so many photos on the plane. Photo of the TV shot from above. The 15-inch touchscreen can be controlled with a remote in your armrest. The TV (pictured above) can only angle towards you on a horizontal hinge which is not ideal if you want to fully recline while watching. There were a large number of different movies in different languages available and great newly released movies. 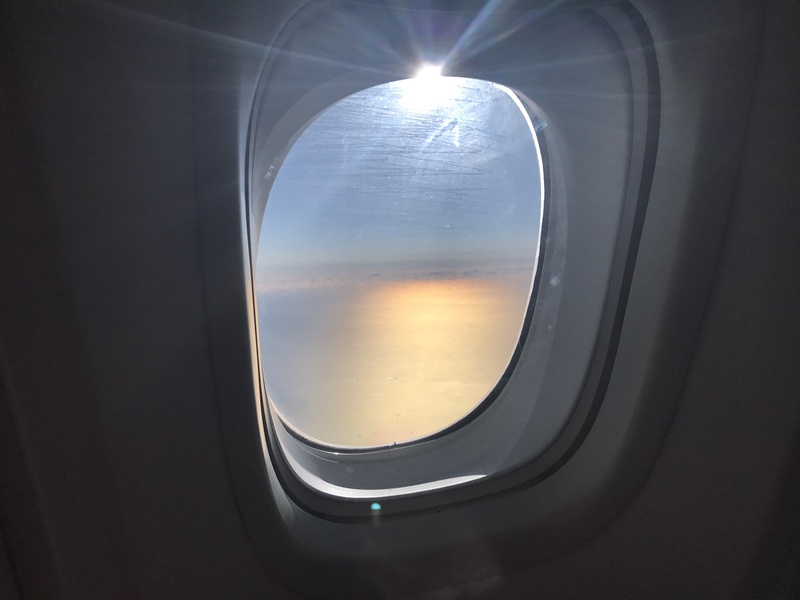 Wi-Fi was available throughout almost the entire flight and allowed us to connect to the live streams for the #FlyingLab available on select flights. 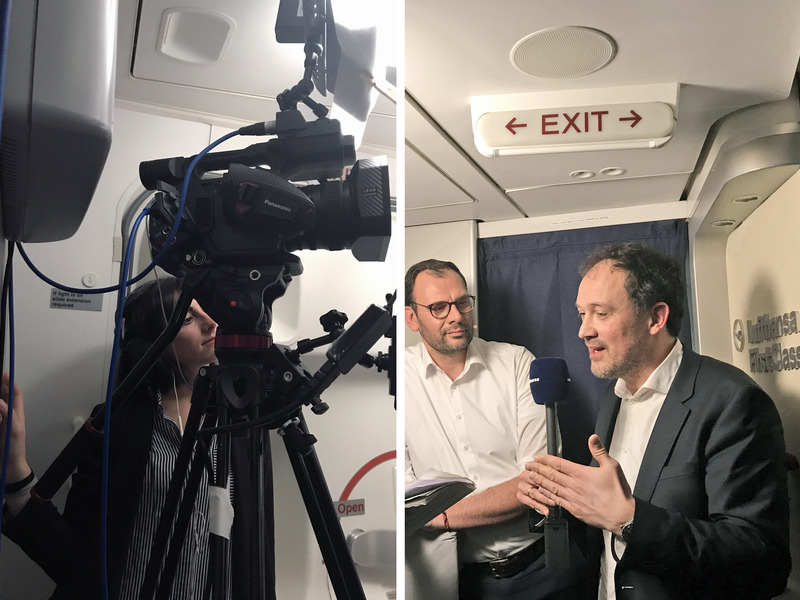 #FlyingLab is a mix between a conference and a Ted talk taking place on the plane which you can watch from your own device. 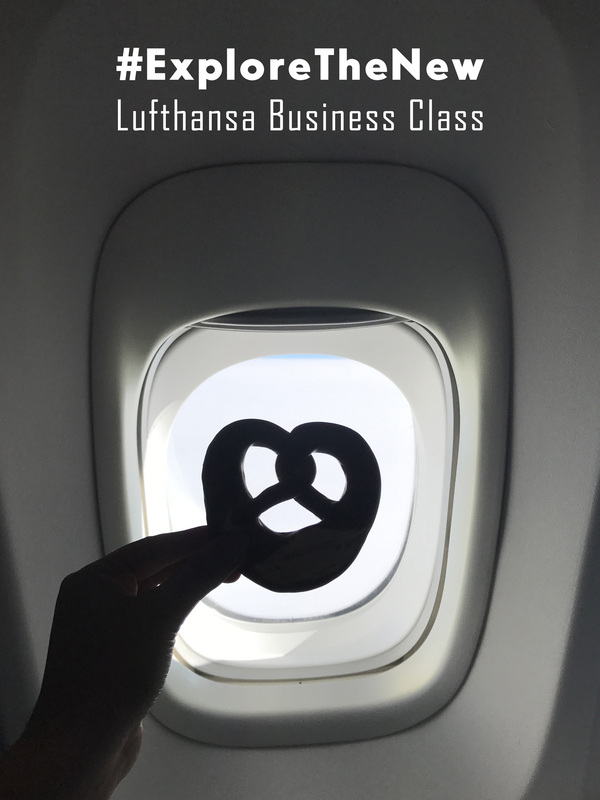 During my flight from Frankfurt to JFK there was a Flying Lab of talks around the new redesign, logo and what it really takes to repaint a fleet of planes. I really enjoyed my business class experiences aboard the large “Queen of the Skies” Boeing 747-8. 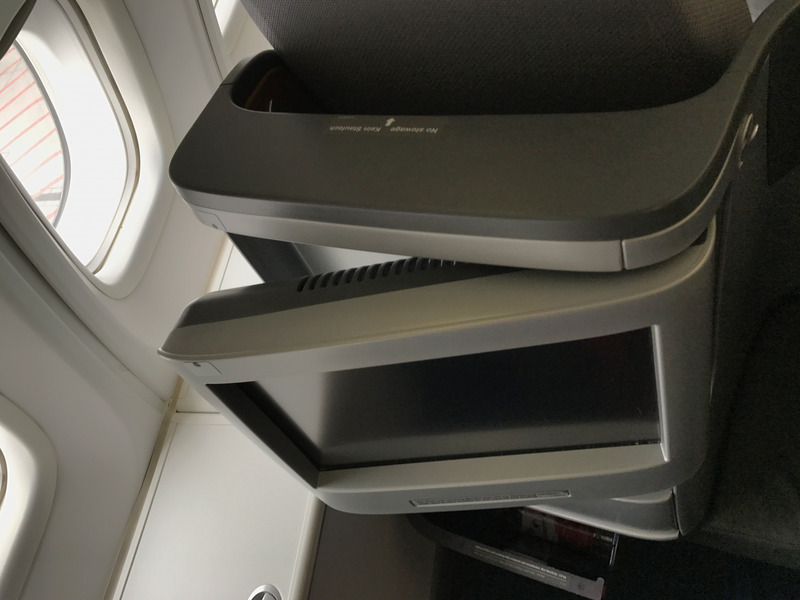 I enjoyed flying on the main lower floor from Newark to Frankfurt but preferred sitting in the quieter upper deck business class on my flight from Frankfurt to JFK. The angle of the seats make them ideal for couples traveling together. 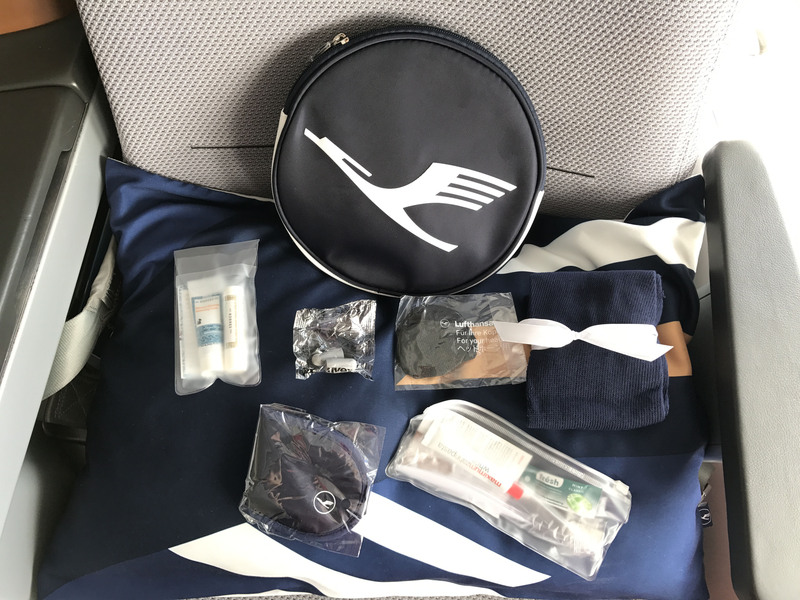 From the impeccable service, great amenity kit, movie and #FlyingLab entertainment to the delicious meal options I would highly recommend flying with Lufthansa and have already booked my next flight to Europe with them! 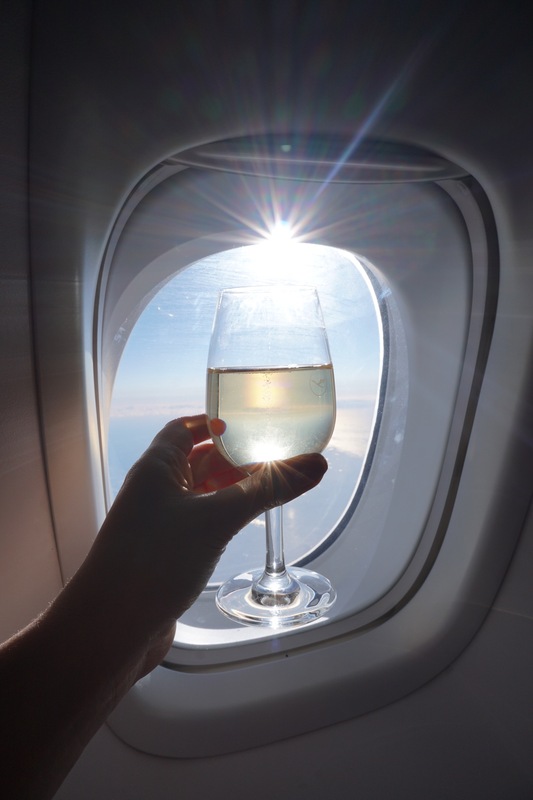 I am so impressed and look forward to flying with your business class in May of 2019. I will fly from Newark to Frankfurt, round trip. I hope it is non stop. Oh yes I did that route non-stop and loved it, cannot wait for your trip, hope it is wonderful! Thank you!